We’ve integrated with Intuit, allowing you to have a single sign-in for both products. If you’re already an Intuit user, follow these simple steps to authorize your integration and start invoicing! 1. From the Quote Roller login screen click “Sign in with Intuit” and provide your credentials. 2. Authorize your connection, to give permission for Quote Roller access to your Intuit account (you only have to do this once). Once you’re logged in, you’ll find the Intuit toolbar in the upper righthand corner, giving you access to your QBO account. Quote Roller will also appear in your Launch My Apps tab within Intuit. 1. Log into your Quote Roller account and go to Settings > Integrations. 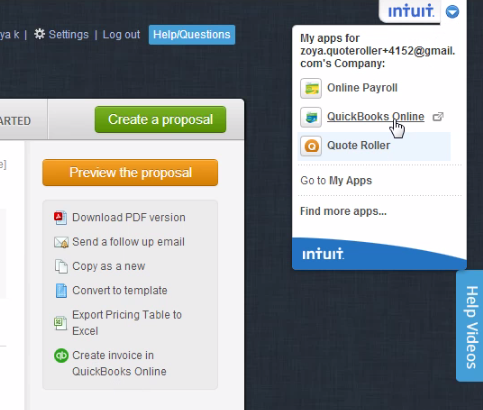 Scroll down to find the Intuit QBO integration. Click Connect to QuickBooks. 2. Sign into your QBO account with your usual Intuit password. By signing in, you automatically authorize the integration until you explicitly revoke access under Manage Apps in QuickBooks or Disable this integration within Quote Roller. 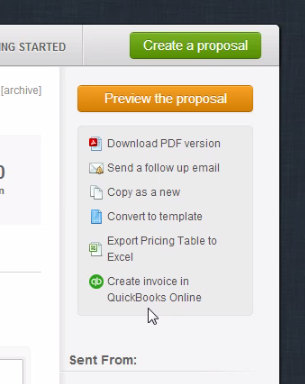 After you complete a proposal you can choose to click the green icon Create invoice in QuickBooks Online in the column under “Preview the proposal” button, as shown below. Now, whenever you want to Sync your QBO contacts into Quote Roller you simply visit Settings > Integrations > QuickBooks to Sync contacts in that one direction. Also, if you want to create invoices from proposals, make sure to keep that checked. Hit Save. Since proposals and invoices are different, some important things to take note of that simply won’t convert. Taxes and discounts from your Quote Roller proposal will not be added to your QuickBooks invoice. Add them manually to your invoice. As always, email info@quoteroller.com to contact our customer success team if you have any questions. What’s next you ask? Why don’t you tell us?